Concept Living is a reboot of our wildly popular Store theme for WordPress, now built to harness the customization power of Layers. Concept Living offers the same visual appeal and front-end functionality, with the addition of Layers building widgets for even more layout control. 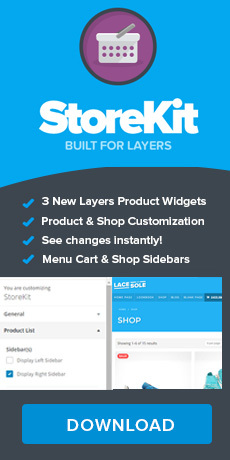 StoreKit is a Layers extension that adds additional functionality to Layers such as shop and product customization, product widgets for your builder pages and a header cartand is included free with Concept Living. Getting a stylesheet not found error? Make sure you unzip the themeforest download package first to find all of the install zips and supporting files! Note: The Contact page preset has a Contact Form 7 shortcode prefilled which may not correspond to your install of Contact Form 7. Simply visit the Contact option in your admin to configure your form, then copy the shortcode at the top of the screen to replace in the Contact page’s widget. You may also use any other contact form plugin or shortcode there. See the Contact & Maps guide for detailed usage. If you leave the Header Cart enabled in StoreKit, you will see a little cart button to the right of the Header Menu that displays the total. When clicked, this will expand the off-canvas sidebar. We recommend placing the Cart widget in this sidebar so the cart can be easily accessed from the Header cart, and also on mobile screens. Our demo uses the Logo Center Top layout with Sticky enabled. Ensure “Enable AJAX add to cart buttons on archives ” is unchecked if you are using StoreKit or Social Commerce. Concept Living and StoreKit are premium products with dedicated support offered through our theme shop at Obox Themes. Register your account or access support here. Please note that general Layers questions or issues, including any customization or CSS help should be directed to our Community forums.